A convenient, all-in-one injury treatment center. Portable - The Icing Station brings strong medicine wherever you need it. • Contains the KNEE, BACK/SHOULDER and ANKLE TheraP compression wraps - or we'll customize a package to suit your individual needs. 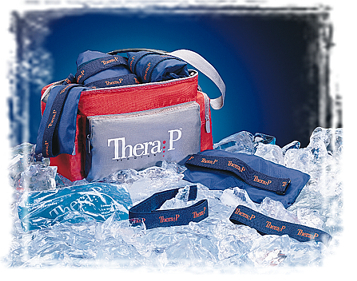 • High quality thermal sports bag means the product will remail frozen for up to 8 hours. Perfect for schools, teams, clubs, even individuals. Durable-constructed wrap ensure long lasting use. reuseable gel pak molds to the knee and provides immediate pain relief. 2 elastic Velcro closures mean the wrap will stay in place, providing relief exactly where it is needed - even if you're walking around. Unique 2 pocket design provides immediate releif to the entire ankle. A "cutout" in the heal means your ankle fits comfortable and snugly. Available in two sizes - SMALL/MEDIUM and LARGE. Compression wrap to relieve the pain of Tennis or Golfer's elbow. Elastic Vecro strap ensures that the wrap stays firmly in place - a great, snug fitting alternative to a bag of frozen peas. • Single gel pak designed to target exactly where it hurts. This item can also be used to treat Achilles tendon - great for runners! Extender straps allow you to place wrap on either shoulder comfortably. Adjustable compression means you can control the intensity of heat or cold. Reuseable gel pak moulds to the "hard-to-reach" shoulder area.